One Free Heart Per Month. Buzz Brain Exercises and Devonish Art Gallery are collaborating to offer one free hand-carved heart each month for the year 2018, to the first person to submit the right answer to a set buzz brain exercise. 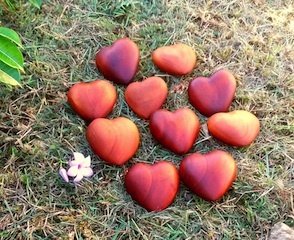 The exercises will vary in degree of difficulty to give every one an opportunity to win one of my hand carved hearts from the Devonish Art Gallery. The January heart has been won by Wendy Bordas from Miami. When Wendy mentioned Mathematics I am not sure if she is referring to the math clue I gave; which was not so obvious or the Math exercises that are posted on the website. Please join me in congratulating Wendy and welcome her to the heart club. I will not publish the sentence for the benefit of those wanting to accept the challenge; but I will repeat the clues. The Buzz Brain Exercise for February will be published on the 1st of the month. February is my birth month so I plan to give away 2 hearts for the month of February, one each to the first and second persons to submit the correct answer. The exercise will be a little different and inspired by an experience in the late sixties when I was a primary school Teacher in Coventry UK; The first black teacher in the city. i hope you enjoy engaging in the brain exercises as much as I enjoy creating them.